Discussion Sales in new SmugMug? 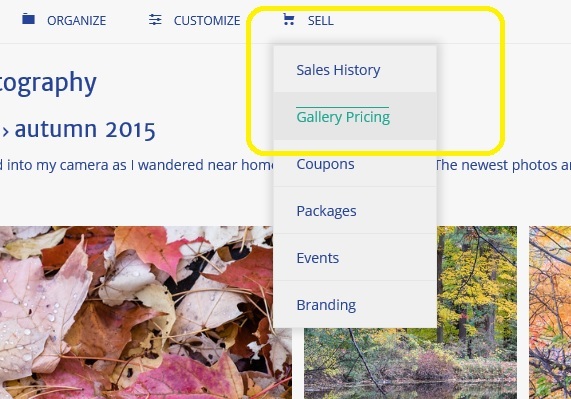 Where are the sales/pricing options for each gallery now located? I created a new gallery, and it didn't give me the option to choose a pricing profile, like it used to do. Do my pricing profiles even still exist? To assign a pricelist to a gallery, from the open gallery click SELL... Gallery Pricing (screen shot below). You can also assign a pricelist from within the organizer. See help page at http://help.smugmug.com/customer/portal/articles/93345-how-do-i-price-photos-in-order-to-sell-them-. Note: Portfolio accounts can have many pricelists. But only one pricelist can be active at a time and applies to all galleries that have printing turned on. Unless you have the highest-level seller account, which allows you to have multiple active Pricelists, so every gallery can be priced differently, if desired.